The new area is still too easy. Even if almost half of the area is travelled underwater and without the Gravity Suit at first, there´s two abilities on my way to make a challenging area: Space Jump and Screw Attack. Sure, there´s spikes and other hazards now, but they´re quite easy to avoid having Space Jump, and underwater it´s even easier, it´s on slow motion!. Screw Attack makes the enemies virtually dissapear from the gameplay. Having trouble with an enemy that takes too many missiles to kill? Press jump. So, I made alternate versions of some of the robotic enemies to make things more interesting. I´m not falling into the predictable "ScrewAttack resistant shields", but I´m making the enemy AI more "Projectile happy". If Samus wants to get close to these enemies, she´ll have to dodge some shots, and having multiple enemies on screen can be fun. Right now these pallette swapped enemies are cheap and unbalanced, especially when trying to dodge their shots underwater. But with some polishing they should be just fine. Regarding the small trolling episode of these last days, I changed the blog settings to moderate the post comments. So don´t be scared if the comments aren´t appearing right away. As always, any comments or suggestions are welcome here or in the forums. cool. sounds like it could be quickly released. keep up the good work. don't forget about the homebrew canel. E-mail me if u need the link again. Also you could potentially speed up the enemies, so that even though you are slowed down by the water perhaps they would not be and maybe some of them would be even faster underwater (native to water environments). Which may cause them to attack you before you have time to jump. You could also position your enemies near spikes so that if you did jump at the enemy to try to kill it you may risk hitting the spike. not sure if i like the idea of brand new never before seen enemies, like, they'll need new names too. but i dunno, guess not every enemy has to be important and based off something from another part of the metroid universe. Right now these enemies are alternate "improved" versions of the robotic enemies. The names could be something like "Autoad V2.0" or something. 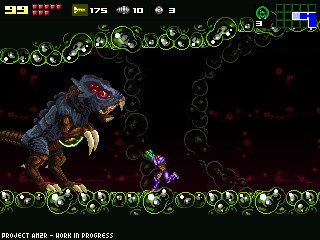 If I can´t make the enemies work well with the level design I might consider the Space Jump restriction. I have to agree, you should put some stronger enemies in the game. Perhaps some of the faster water enemies could dodge your screw attack by moving to the side. Also, I don't see a problem with a spiked underwater enemy that your screw attack can't hurt. Anything you can do to make the enemies less predictable also would be nice. As for another way to make the area more difficult, you could add waterfalls similar to the sand falls in Maridia. Restricting the player's movement above water in certain spots would add to the challenge. Also, I realize you aren't always too fond of this idea, but please remember that you always have the option of expanding the area. I'm not talking about lots of huge new rooms, but more smaller rooms. Giving the player more areas to explore, even if the areas are optional, would lengthen the game in a non-artificial way. Seeing things such as dead ends and mazes would make the game interesting, too. I'm not sure if you have ever played Super Metroid Redesign, but I always liked the way the path to Draygon was challenging to figure out. Giving the player these tricky challenges will lengthen the game for new players, but old players will still be able to get through the areas pretty quickly. I'm starting to worry that the new area might be too hard for me. I mean you're a pro at this game but I've only played it once...for 5 minutes,(I gave up because I got lost from the beggining). Haven't seen you for quite a while. Please let us know what do you think about the Power Suit design proposed on the forum. As for the enemies, congratulations on keeping the post-Screw Attack gameplay interesting! A type that could only be safely reached from afar would also work (enemies that curl into spikes or Samus-eating plants for example). Just an idea. Like others have said, in the I don't remember the Screw attack working underwater in Zero Mission until you got the Gravity suit. I think the same should apply to the space jump as in Fusion, it also didn't work without the Gravity Suit. If anything, make these restrictions happen so the area itself is a challenge rather than the enemies. If not, make it so the enemies have to be hit by a certain type of attack before they are vulnerable to the Screw Attack. Maybe you have to hit them with a charged Ice Beam to freeze them where they then become vulnerable to the attack. I still prefer to have the Gravity Suit in underwater places. Say, about how hard will this game be compared to other 2D Metroid titles? 2)Shoot them and be vulnerable the whole time, but significantly reduce the amount of time it takes to kill enemies. And with that, I just single-handedly solved your problem with the difficultly of the last few areas. Yes, I know, I'm a genius. No need to thank me. You should consider adding more obsticals than spikes, such as raw magma, or electricity. What about Fuel Gel from Prime 3. For a new enemy you should have an electric type creature, that would be neat. For extra game length add part of the surface area, and a waterfall would be cool. So now that the game is longer will there be brand new items? The Ice Missile would be a dope addition. Maybe add a new beam, perhaps the Nova beam.. Good luck with rest of the game. Oh, Doc, the 2.0 idea is kind of lame.. Sounds just like Hunters. IMO new enemy's are the way to go. I've said it before and I'll say it again... are you testing this difficulty with other players? What seems easy to you may be tough for the average player, because you're the chief designer who instinctively knows things a normal player can't possibly know. I trust you, but I hope you've added beta testers to the process. If you haven't please do so. Why dont you release a "demo" version of what you already have made so we can add some ideas according to what we see. Anyway like mano said, think about that space jump does not work underwater without the gravity suit. Also you can make them resistant to screw attack like some enemies from super metroid. I think the idea of a few new enemies is a good idea. Bearing in mind that the Original Metroid 2 had a limited amount of space on the cart, and so enemies were rather limited, so I don't see any reason why you can't throw a few more in. Also, in regards to the Space Jump and Screw Attack, It's fairly true in any Metroid game that once you've got the Screw Attack you can pretty much blitz your way through the rest of the game, but the Screw attack is usually the last item picked up. One thing you could do would be to move where you pick the Screw Attack up, so you don't get it as early, maybe moving it to the area with the final few Omegas. Or maybe you could create areas where you can’t use the Screw Attack for some reason. I think Mano has it right. I think in fusion it worked the same way. I hope he doesnt get carried away and make it too hard.. its really easy to think your game is easy when you're making it, as you've played it a million times in testing. 2 questions. one, when is this game coming out. Two, is it going to be an offical metroid game? I agree with Mano, if you don't have the gravity suit, the space jump and screw attack shouldn't be able to work under water. would make a much better challenge. or just a similar remake? I Agree been working as a beta tester for gameloft for ages, and i do think it's a good idea to add beta testers to your project. You should make it so that certain courses limit the powerups available. For example, a platforming course where you can't use Space Jump, or defeating lots of enemies with only the power beam and misiles. Hey doc, about the screw attack problem. I'm surprised no one has actually suggested this option before. In Super Metroid, right outside Ridley's boss room, there are two pirates that are immune to all damage except when they jump to kick you. Why not have enemies that are invulnerable except at a specific time that they react? In response to you, it's a fan made game. It's a remake of an official game, but since this is not licensed by Nintendo, this is Doc's game. Doctor 64, it seems like things are winding down in respect to the project; are you at all worried of Nintendo and its money-hungry lawyers and IP agents? Will you be making this game compatable with the Dingoo A320? It is an portable open source gaming device similar in layout to the super nintendo. I think it would be awesome to play this game on the go. the device does support linux so a port might not be too dificult. Space Jump bajo el agua y sin Gravity Suit?? Creo que se ha equivocado Doc. When you finish this, you should SO make a 2D version of the Prime Trilogy with the same engine and graphics as AM2R! Why not just disable the space jump and screw attack underwater if you don't have the Gravity Suit? Will there be any reserve energy tanks? Asking Doc to make a 2d Prime Trilogy is equivalent to asking him to kill himself. Are you sure you want to go asking for that? ☺ ¿Van a haber tanques de reserva? What about a machine that mass-produces smaller machines that latch on to Samus that prevents the Screw-Attack (or slows it down sevearly) while the main machine shots at Samus to knock her out of Screw-Attack mode. The only way to get rid of the smaller machines is to Morph Ball and drop bombs to destroy them (or Smart-Bomb if available though not sure if that will be added since this is M2 and not SM). Now that's just silly. You're trying too hard. One thing you need to make sure you stay away from is anything that would inhibit abilities the player has already earned. With the exception of Zero Mission (which didn't go over very well), Nintendo has NEVER done that. The reason being that it makes the player feel gypped. Super bomb has been confirmed for AM2R; in fact, it's in the trailers. Also, pcod, are you entirely sure about that? i noticed on this update that you said the new area was to easy with the space jump and screw atack, even being under water without the gravity suit. i remember in the other games, the space jump and screw attack would not work under water without the gravity suit. what say you??? good work so far, i can't wait for this game to be ready to play!!! Am I sure about what? That Nintendo never takes away abilities a player has earned already (within the boundaries of a single game), or that players generally feel gypped when developers pull that kind of stunt? I'm pretty sure I spoke the truth for either point. Nintendo occasionally does use that tactic, and the ploy can work when there's a legitimate reason/excuse for losing the ability. I think. I could, of course, be wrong; in which case, I apologize. I actually really liked Zero Mission (even the Chozodia stealth bit). I was referring to the general public's apparent view of the stealth part. Have you check my post enemies ideas Dr? I like how this project is going, I bet Nintendo are trying to hire you Dr. I say make the game as hard as you want. Outside of game-breaking hard ,bring it on. And all the rest of you need to start reading previous posts before you say something. Seriously! Do any of you realize just how much your combined posts sound like a broken record? So what's the new total Metroid count? In the 50's? More? The more the better! Anyways good luck with the rest of the game, and the beta testing. I always thought it was weird that the Metroids numbered so low on SR388. I thought they'd been there long enough that there should be a few hundred of them. OMG That's what I'm saying Ben. It never made any sense to me. So how arw the "new" enemy's coming along? I check back on your project every couple of weeks to see how you're doing, and thankfully you always seem to be barreling forward in terms of development. Although I am not deeply involved in the forums, nor do I comment often, but I am very interested in the release of this game. I look forward to see what you have in store next... all of your current tweaks sound like they'll translate well into the gameplay. just add a temporarily shutdown and youre good to go. an electromagnetic field that deactivates the screw attack, varia suit, whatever. takes a few seconds to start it up again, leaving you vulnerable. What is it with you people?!? The Chozo don't make crappy products! Samus' suit and abilities are specially tailored to handle environmental hazards. You want Samus' armor to be vulnerable to EMPs? Am I hearing this right? STOP. Just STOP. No temporary shutdowns, no revoking of abilities, nothing. NO. Stop trying to break the game. This has been a true fan's thoughts on your twisted ways. Game looks really good. Just one question, when ur done with it, wat kinda file r u ganna make, a gba file, ds file, snes file? Only her VISOR was susceptible. All the rest of her stuff worked fine. You just couldn't see what you were doing so well. And during a screw attack I don't recall EMPs having any effect at all. Not to mention the part about that version of the screw attack not being the original, but a hybrid version. And as we know, products manufactured by a third party tend to cut corners. That's the only way I can justify what Retro did to it. The Chozo made all of Samus' original stuff, the Metroids, and Mother Brain, all of which worked exactly like they were supposed to. The problem with the Metroids and Mother Brain was that they worked TOO well. I believe it will either be released as Windows Executable or Game Maker file. The water area should be more challenging also i do not agree with deactivating the Screwattack in some areas i'd sugest that instead of deactivating samus's abilities you should put enemies that resist many impacts of the screw attack and make samus to take damage too just as the fight between Sa-x and Samus when they collide their screwattacks both of them recieved damage. How about that idea? i dunno in my personal opinion it would be better because it can be challenging and the player won't rely on doing cheaps attacks such as crushing everything on his way with the Screw.A. Another fact is that if you want to make the game hard at some points of the game so do it Doc. Because it would be fun and your game would not be the same easy games as the original ones so try to make a balace in the game some parts really hards and other easy parts and i would like the bosses to be challenging to at least...most of the bosses. Hey, about the new music... could we have a MP3 download or something? I'd really like to have that awesome SR388 Main Tunnel remix... and the Encounter wouldn't be bad either. As for the new Chozo area, what are you going to put? Absolute new music, or a remix of somethin? I don't agree with the whole "disabling screw attack temporarily thing". new enemies with different AI's or screw attack resisting features would be much better. And another thing... screw attack or space jump never worked underwater without the gravity suit. I think it would be a good idea to study the last level of Cave Story. By that time, you're armed to the teeth and you can kill enemies without even shooting at them or touching them, so how is it so bleeding difficult? Hey thanks for your efforts in making this. I spent many hours on Metroid II and I'm looking forward to what you come up with. Are you suggesting that the player should have to put up with an ammo count for the screw attack? I sincerely hope not, because people who lack my strength of will wont be able to stop themselves from lynching you. That's right. We KNOW where you LIVE. ^ hax. What do you use, IP Tracker? Nintendo shut down Metroid: Coven, Metroid SR388, and will shut down your project too. Learn how to be a hacker and start erasing their databanks. 1) If Nintendo tries to shut down the project, a good explanation in court that your project is a not-for-profit game designed to recreate the feel of the original Metroid II game by modernizing it, and is in no way designed to take away from their potential to earn a profit. In fact, let them know that fan projects like yours are pretty much "free advertising" for Nintendo and their products, by recreating the feel that Nintendo has strived so hard to bring fun and enjoyment to players. Plus, it gives a sample to how the gameplay for Nintendo's Metroid games would play like. That SHOULD get them to back off just in case. 2) In terms of adding a challenge, and what's said about the screw attack, ensure that MOST items retain their original positions matching that of the first game. (Just like what Metroid Zero Mission did.) Of course, you can expand the map a little, replace some of the missile expansions with super missiles, and include power bombs and such. This will maintain nostalgia for older players. 3) Continuing the regard of a challenge to players new to the game: Rather than screw-attack resistance, position enemies in places that make it a puzzle to pass through the underwater stages. Also put in some secret passageways to allow faster movement, just to make the game more interesting and to add to the 'searching for secrets' aspect of gameplay. 4) Try to retain the original map structure, secrets, etcetera when making the remake. 5) Create new tiles to help give the game a more unique map feel. Don't be afraid to use older tiles, and I like the screenshots on how it looks, but custom tiles need to be made and used, too, in order to maintain the unique and original feel of the initial game. Again, try to expand the original feel of Metroid II, and don't change too much of the map in order to retain the nostalgia of the original. You're trying to recreate the game in a fun way with new powerups and items, and it's not that easy. I wish you luck, and I hope the game runs well. Finally, sorry for responding in this late section, but I just wanted to respond appropriately. And yes, the idea of adding a few new enemies is completely all right.